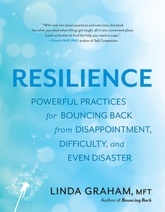 More than 100 evidence-based practices for building the brain's ability to bounce back from adversity, written by therapist and expert in the neuroscience of resilience: Linda Graham. Resilience is the learned capacity to cope with any level of adversity, from the small annoyances of daily life to the struggles and sorrows that break our hearts. Resilience is essential for surviving and thriving in a world full of troubles and tragedies, and it is completely trainable and recoverable — when we know how. In Resilience, Linda Graham offers clear guidance to help you develop somatic, emotional, relational, and reflective intelligence — the skills you need to confidently and effectively cope with life’s inevitable challenges and crises.